On the wedding day every bride wants to beirresistible and unique. Girls advance think over its image, its parts and every detail. 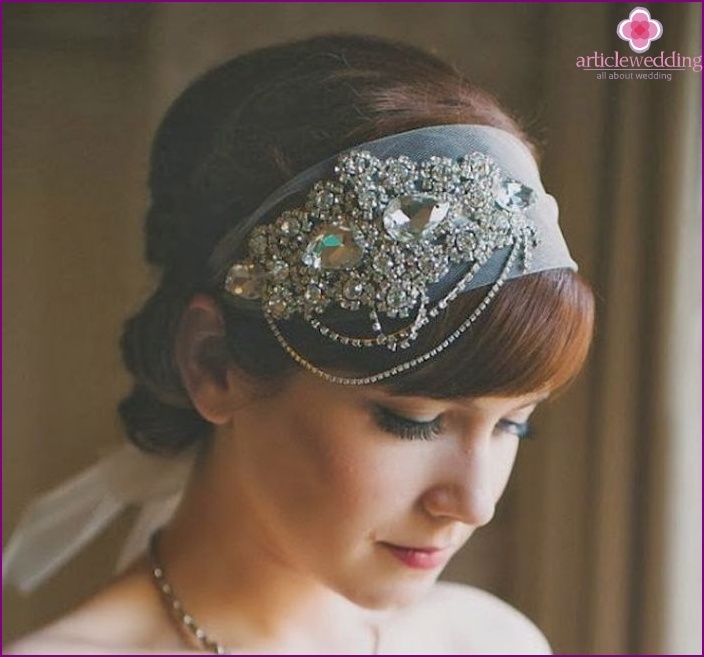 An important role in the appearance of the bride plays the hair styling. Beautiful wedding hairstyle with rim in demand for many years. Even during the ancient times women in Russia use different hair ornaments: garlands, kokoshniki bandages. The rim with an elastic band - a modern accessory that helps to bring notes of romance. Some brides refusing to wear a veil,considering it a relic or superstitious tradition. Our ancestors believed that the wedding veil protects the girl from the evil eye, protects her from the evil eye and troubles. Thinking her wedding image, sometimes women refuse to use it in a veil because of the complexity of creating beautiful hairstyles with this accessory. But the veil is like no other wedding accessory that makes the bride unique touching, tender, giving the appearance of her innocent purity. Suitable for any type of veil, color or lengthhair. Looks nice combination of wedding jewelry with exquisite rim. Hairstyles with such details look attractive and fashionable. Rim combined with a veil of any kind. It is made as a multiple tiers, and a single. A solemn three-tiered accessory recommended combined with technically complex hairdo that uses bezel decorated with bright decorative details (stones, pearls, sequins, artificial flowers). Shorthair brides planning a wedding inChurch, it is necessary to look at the hairstyles with veils that cover the head, and give the appearance of a romantic classic look. Rim combined with both short and long veil. The long flowing veil should be combined with the silhouette of the dress. Give an additional amount of hair does not make sense. Ideal - slicked back hair slightly curled ends, which are collected at the site of attachment and complement thin or wide rim decorated with middle-sized parts. Owners of the high forehead, it is desirable to makefocus on the bangs. The rim fit straight thick, asymmetrical bangs or milled, the accessory is fixed at the base veils. If you have a square or a bob hairstyle, you can choose the packing in the Greek style. For this hairstyle you need to choose the right color on the rim of gum, fix locks can not be without it. For this hoop is put on the head, over the entire length of braid strands by passing them upwardly and inwardly through the decoration. Then the remaining free locks at the nape collected in a bun, which is attached to a veil. Chubby girls hairstyle perfectly suited toretro style. Strands laid gentle waves in the style of Hollywood beauties 20-ies - the perfect solution for a thematic wedding. The rim for a hairstyle can have large spare parts. In choosing a veil is recommended to give preference to short-veil mantle. Creating a wedding hairstyle for short hair, it is advisable to abandon the complicated tangles, emphasizing the elegant and neat rim veil. Careless simplicity - a fashion trend in the weddingfashion this season. 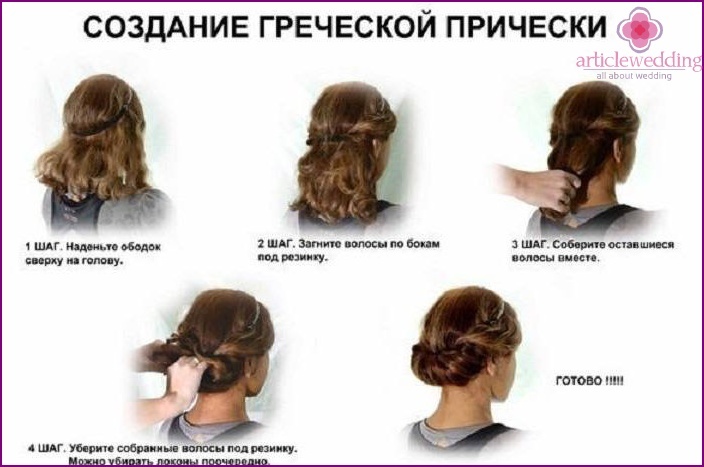 More and more young girls abandon complicated hairstyles with multilevel weaving in favor of simple, supplemented with original ornaments, for example, the rim. Wedding dress combine with flowing hair of medium length, are stacked light careless curls. This hairstyle gives the image of femininity, romance. To emphasize the natural beauty, hairstraighten or twist. Would you like to give additional volume to hair, make a small fleece on top, at the bottom of which fasten the rim. Wrap decorate according to style of dress: flowers, ribbons, stones. Will give a complete image veil, which is attached by pins at the base of hair. Hairstyles with braids do not lose their popularity,they are still relevant and fashionable. 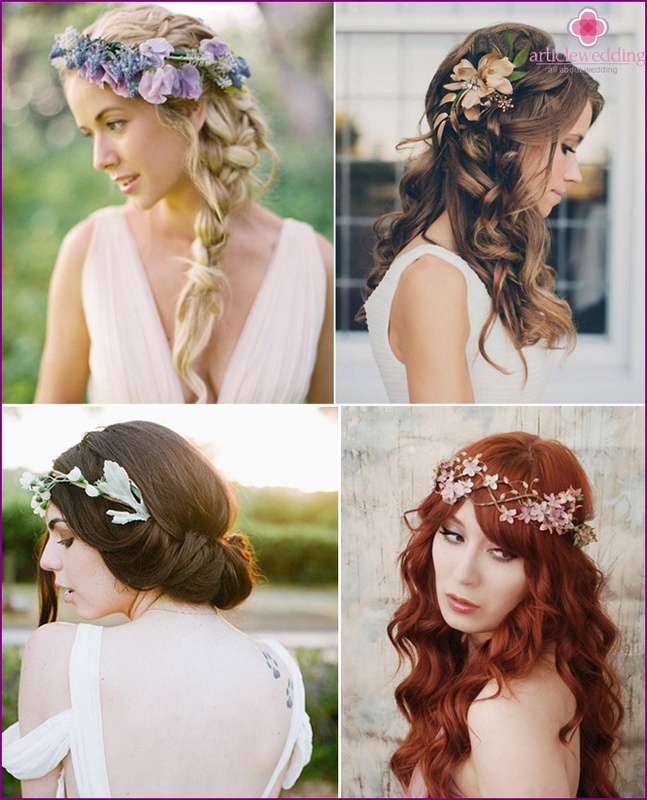 The original weave braids in wedding hairstyles is very beautiful and stylish looks. Use both bulk and sloppy technique of weaving. To give extra volume to do a little bouffant at the crown, loose braid French braid, which release several pryadok. Garnish with a stylish haircut recommended original decorated hoop and veil. The rim is actively used for wedding hairstylesfor medium hair. With it is possible to create a visual deception, giving the hair volume and length. To set hairstyles tions in retro style, you need to straighten your hair smooth ironing, make bouffant at the bottom, throw a bang back and hugged rim. It looks beautiful in combination with a straight cut dress of satin shiny fabric. Headband - is an accessory that can not be involved in the role of fixing the locks, and used only as a self-sufficient a refined decoration. Long hair gives room for imagination whencreating a wedding hairstyle for hairdresser, and for his clients. 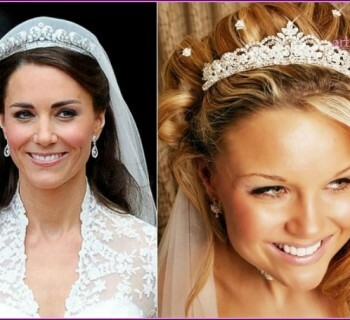 When choosing a hairstyle it is recommended to pay attention to the structure of the hair of the bride. Owners hard strands fit with braided hairstyle as long braid will retain its shape and stay well. They look hairstyles are fresh, stylish and fashionable. Women with thin hair is not damagedshould overload your image additional decorative elements. The thin bezel and a transparent veil would be enough to make the image of a solemn and public, complementing its large curls and careless curls. Thick, lush long hair and so look likedecoration women. To hike down the aisle can give preference uncool curls that little curl soft curls. 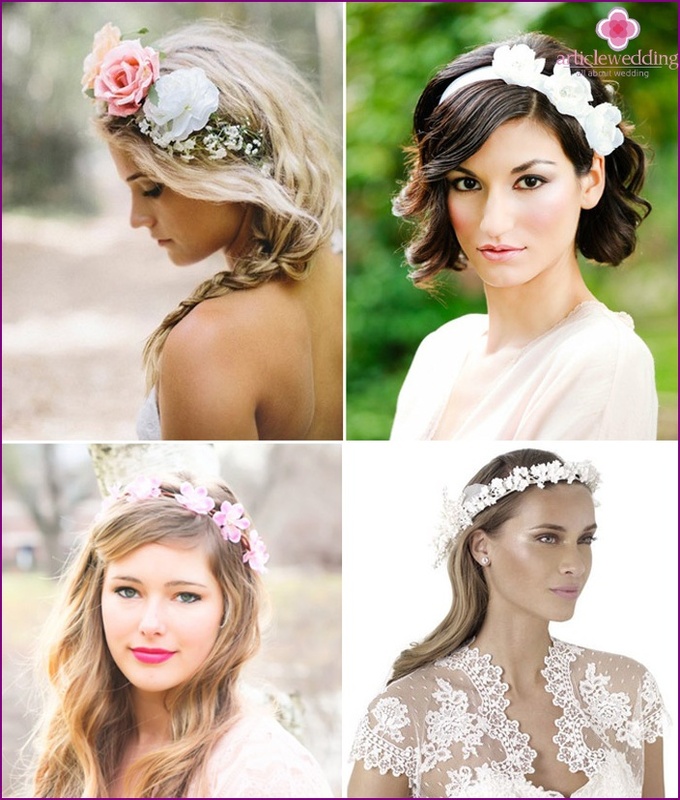 Emphasis will give hair bezel decorated with shiny stones or flowers. Complement her veil, a style that will blend with the chosen decor hoop. Horse tail with slicked back strands- Ideal for everyday and wedding hairstyles. Make it an evening hairstyle elements helps magnificent bouffant at the base of the tail, complete with elegant rim, veil and oblique bangs. Also popular hair bow. Form the bow of the strands as high on the top, and in the back of the head. Beautiful and festive look several smaller bows of hair in a wedding image bride. Effectively looks high beam with a rim ongum. This accessory not only serves as an additional decoration but firmly secures the hair, preventing strands to break out of it. In the absence of the rim would have to use a lot of nail fixation, which can lead to weighting curls, their bonding and loss of appearance by the end of the wedding celebration. With the help of the rim high beam will last the entire day of celebration. Fatou is attached to the occipital region at the base of the beam. How to make a hairstyle using the rim with an elastic band? Make a vertical parting in the middle of the head and divide all the hair into two equal parts. Slide the accessory. For it is securely held and does not let you down at the wrong time, it is recommended to fix it invisible in the neck. Studs and stealth will not be visible, they closed down the strand. On the left side, take a medium-sized strand and wrap it over the top of the bezel under the gum, sticking out from the bottom. Repeat with the remaining wrapping rim locks. The ends of the curls using stealth securely lock in hairstyle or keep flowing. Hairstyles, complemented rims, do bothbangs and without it. If you decide to abandon bangs, then it must be combed to the side with the other strands, or split into two sides for direct vertical parting. The front lock can be pulled back in the direction of hair growth. Secure varnish. Additionally fix the bangs invisible do not need this feature on will bezel. Options for creating pilings with a bang set. So, you can leave it straight, pre-treating a small amount of wax or put slightly to one side, and the tip of the strand to hide behind the ear. Another option - is to put an elastic band on top of the hoop head on the loose, slightly curled hair, then leave a romantic bangs falling in front or on the sides. The original hippie style wedding in nature is provided to you. Finding the best wedding hairstyles brideview multiple photos, read descriptions and useful recommendations. With our tips you will be able to choose. Want more ideas? Watch the video below, which shows a few options for using hair accessories to create the wedding pilings. 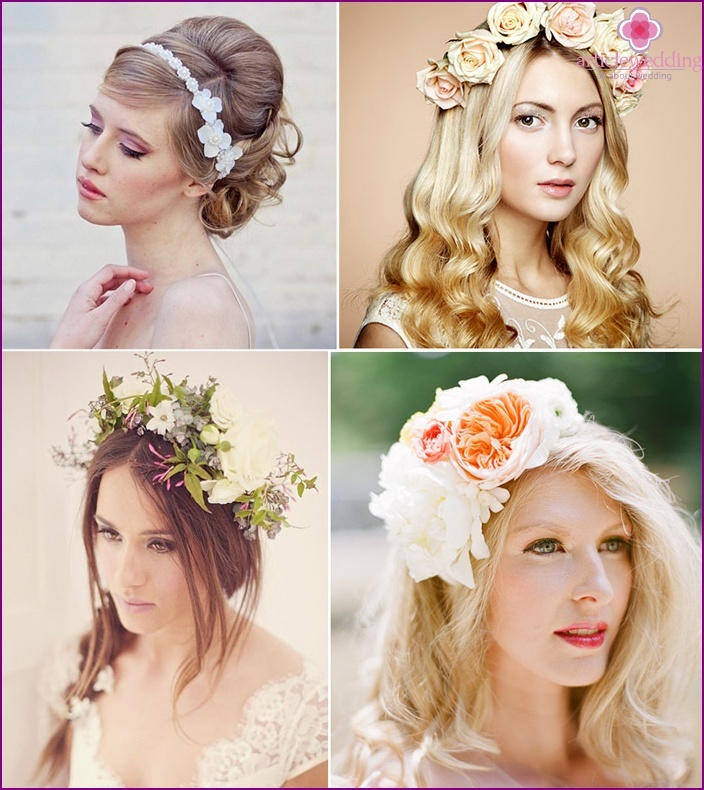 Bride Hairstyle: what you need to consider?